Inside every secret, there's a world of trouble. Get ready for the second book in this new series of global proportions, from master of intrigue, New York Times bestselling author Ally Carter. Grace's past has come back to hunt her... And if she doesn't stop it, Grace isn't the only one who will get hurt. Because on Embassy Row, the countries of the world stand like dominoes, and one wrong move can make them all fall down. It's been seven days since Grace was embroiled in an international scandal on Embassy Row, where she is now trying to come to terms with the revelation over her mother's death and the scarred man that has plagued her nightmares since as long as she can remember. Brother Jamie has now returned home from West Point and has brought a friend, fellow student and recruit Spence who is more than happy to watch over Gracie, especially now that Alexei has returned. After a show of male dominance, Spence's body turns up washed up on Embassy Row and Alexei becomes the main suspect. The volatile Russian Embassy want to turn Alexei over to the authorities in order to maintain peace, but through a series of whispered conversations, Alexei is guilty until proven innocent and justice for the young Russian will be at the hands of his demise. But what Grace uncovers while proving Alexei's innocence will bring her world crashing down. Spence's death isn't an accident and what he may have stumbled upon will put all their lives at risk. A long standing myth and centuries of secrets will reveal the foundations Embassy Row is built upon. Ally Carter is amazing. 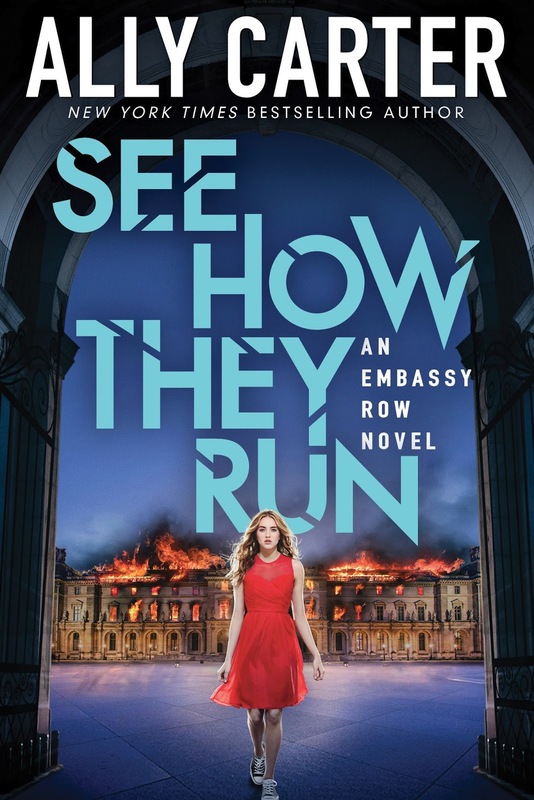 Not only has she yet again crafted an incredible installment in the Embassy Row series, but has upped the ante with more action, more suspense and a shitload more intrigue and danger that will ensure readers are kept on the edge of their seats. Once again we're transported back to Embassy Row, where nations live in unity but tensions remain at an all time high. It follows Gracie, the granddaughter of the United States delegate who is still coming to terms with her mothers death and the hand she played in what she sees as destroying her family. It's no wonder older brother Jamie has returned home. I found it strange that in the midst of what is a setback to Grace's mental health, her brother would bring a friend to tag along. Spence was suspiciously protective of Grace, especially as Alexei returned to the Embassy and even came to blows with the Russian. He added nothing to the storyline, and felt as though he was trying to take advantage of Grace's emotional state, even if he wasn't entirely sure why she was so fragile. I didn't like Spence. As a character or attempting to become a love interest and I'm not surprised at Jamie's rage. 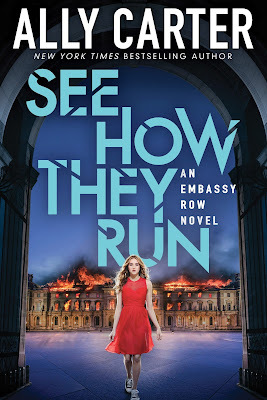 In See How They Run, Grace now has more secrets to unravel with the introduction of the history and mythology behind Embassy Row, which surprised me. Sadly it didn't elaborate on the mystery beyond a treasure in which a secret society of woman on Embassy Row vow to protect. I'm hoping the third installment will expand on the mythology rather than the focus being almost solely on Grace's well being. Grace and Alexei have a strange relationship. Initially Jamie's best friend who was asked to keep an eye on Grace in her brothers absence, Alexei and Grace are both attracted to one another but neither willing to admit how they feel. The romance between the two is a little too slow burning. I can understand why given Grace's situation but it's still frustrating for readers of the series nonetheless. It's far too drawn out. I love this series. It's so wonderfully written and Grace is such a likable and intriguing character who always manages to find herself embroiled in the politics of living on Embassy Row. It's an engaging, quick read that is impossible to put down. But be warned, Ally Carter is known for her cliffhangers and this one's a doozy. It wasn't as incredible as the first book, but still super entertaining and a pleasure to read. I think it was mainly the issue of the romance that is starting to annoy me a little. I think the men in Grace's life also tend to coddle her. I'd love to see her pick herself up and start making smart decisions in book three. Sounds like a fun series! Glad you liked the latest addition. I've never read anything by Ally Carter, but I probably should. I think my sister might really enjoy these. If you like adventurous fun, she's a wonderful author who knows how to entertain an audience Lauren. I'd love to see what you think of the series. Hey, I read book one and liked it! Weird that I didn't really see any buzz or reviews for this one. I thought the setting and world was pretty unique and brilliant. And I felt like that about the romance in book one, like it was a bit toooo slow. I think this one in out on audio, I need to check it out! I'm surprised that I haven't seen more reviews for it either as I really enjoyed book one as well. I don't think you'll enjoy the romance any more in this one though, it's not just slow, but glacial. That's one of the few annoying aspects for me, the romance. But overall, still a great read. Oh yes Sarah, you must! It's such a great read. It'll entertain your socks off. I think it was more curiosity for me, seeing I enjoyed book one so much. A strong sequel but the romance is holding it back a little. Would love to see what you think of it Zoe. There are so many of her books I've wanted to read over the years but haven't. This series sounds really good, and a lot of people seem to like her writing. Great review, hopefully I'll get to it one day. I hope so too Christy. She's a wonderful author and I'll be seeking out a few of her previous titles now too. I still need to read this! I LOVED All Fall Down and the embassies and Gracie. Although I can't remember much else, honestly. It's been so long since I read book one. Luckily this will give you enough prompts to remember what happened in book one, as I forgot a lot of the little details too. It's a great follow up. Not as strong as book one but superbly entertaining nonetheless. I've heard so many great things about these books. It's sad that I probably won't be getting to it anytime soon :/ But I'll see if I can find it at the library soon! With Ally Carter such a massive name in young adult, they probably wouldn't be hard to find Alyssa and so worth the read. I'm loving the series and can't wait until the next installment. I'm so glad you like this series, too, Kelly! I was actually surprised by how much I liked both All Fall Down and See How They Run. I always thought that political intrigue wasn't really my thing, but the way Carter weaves emotional and personal storylines into that overarching plot is really enjoyable. I actually LOVE how slow-burning Grace and Alexei's relationship is. I think it's fair to Grace, considering she's not exactly in the right frame of mind for a romantic relationship. I like how much they support each other, without expecting anything in return. I'm hoping there will be a full blown romance between them one day, but I do like how their relationship is at the moment. I have no doubt that we will if the first two are any indication. I agree about the romance, considering Grace's emotional state at the moment, but I feel like it needs a little more depth between their connection or I worry they'll go from this fierce attraction and sexual tension to being in love and nothing in between. I couldn't agree more. I think it's those character storylines that drive the story along but the setting and political aspects just give it bit more of a mysterious feel. So glad you're really enjoying the series too poppet.